Aqua-Quest Makes the Very Best in 100% Waterproof Outdoor Equipment, Gear, & Apparel This 'Combo' is an Exceptional Piece of Sporting Equipment. It's Waterproof, Extremely Lightweight, & Incredibly Compressible. The Ultimate in Waterproof Camping, Aqua-Quest Combines this Tarp with the Aqua-Quest Single Pole Hooped Bivy, for the Most Comfortable, Compact, & Lightweight Camping Experience Possible. By Using this Combo, Recreational Campers will Enjoy Dry Space or Shade around their Camp, and More Adventurous Campers will Enjoy Waterproof Protection that Will Stand Up to Even the Most Extreme Weather Conditions. Gear Out Here is Proud to Present Aqua-Quest Products - Tested by Over 10,000 of Our Happy Customers in the Wildest Conditions on Earth, from Africa to Antarctica. We Know You Will Be as Satisfied as They Are. SIL TARP: 40 Denier Nylon Fabric with Dual Silicone & PU Coating. Heat-Taped Seam Construction Guarantees Waterproof Protection. Hydrostatic Resistance of 20,000 mm. 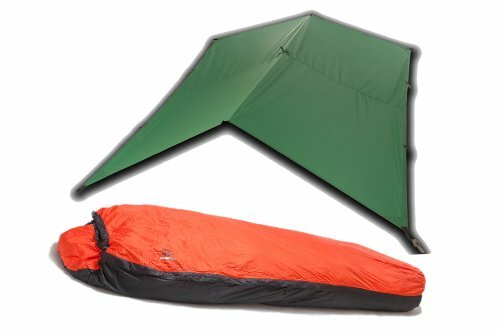 Dimensions (Approx): BIVY:Capacity: 1 Person. Weight: 1.26 lbs. Area: 91 X 33 in. Width at Shoulders: 33 in. Width at Feet: 18 in. Packed: 14 X 6 X 2 in SIL TARP: Weight: 1.8 lbs. Area: 154 X 116 in. Long Side Grommets: Every 39 in. from Corner. Wide Side Grommets: 37.5 in. from Corner. Packed Size: 12 X 6 X 2 in. If you have any questions about this product by Aqua Quest, contact us by completing and submitting the form below. If you are looking for a specif part number, please include it with your message.